The number of Jewish settlers living in the Gaza Strip and some West Bank areas has risen sharply since Israel said it would unilaterally withdraw from them. Settler numbers in Gaza have risen by 4.3% since PM Ariel Sharon unveiled his disengagement plan six months ago. The fastest growth in Gaza was seen in the settlements due for early pullouts - while one West Bank outpost marked for withdrawal grew by almost 50%. Settlers say they plan to mount stiff resistance to Mr Sharon's pullout plan. Sa-Nur, one of four isolated settlements to be emptied in the northern West Bank, went from a population of 38 to one of 69 with more families arriving all the time, according to an interior ministry report. 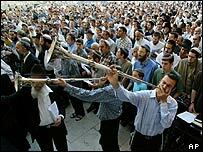 The number of Jews living in the Gaza Strip rose by 338 - about three times more than the population growth rate of 2003. The number of Jewish residents in Gaza now stands at 8,158 the report said. Most of the new residents appeared to have gone to the isolated Gaza settlements Kfar Darom, Morag and Netzarim, which will be the first to face evacuation. By contrast Ariel, a large Jewish settlement in the West Bank which Israel does not intend to vacate, grew by just 23 people, or less than 0.2%, in the past six months. Settlers in Gaza and the four West Bank outposts are expected to receive hefty pay-offs which will increase according to how long they have been residents. A government spokesman brushed aside the significance of the growth in settler numbers, saying that dozens were already inquiring about the compensation deal. Mr Sharon has put forward the disengagement plan to reduce Israel's exposure to attack from Palestinian militant groups by abandoning isolated settlements and enclosing most Palestinians behind barriers. A spokesman for the Settlers' Council, quoted by Associated Press, denied the settler leadership was trying to torpedo the disengagement plan by increasing settlement numbers. It is about "strengthening the ideological core" of the settlement movement, he said. All settlements are considered illegal under international law and Israel has committed itself to freezing settlement activity under the international peace plan known as the roadmap. "It certainly looks like he has made this move because of pressure"